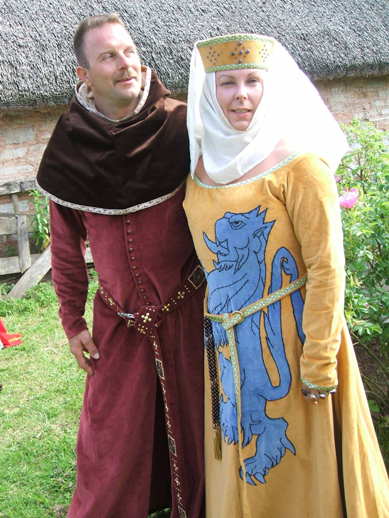 We have had a lovely day today – three of my friends from my medieval group came to do some embroidery and we had a very nice time, researching, chatting and stitching – oh and having very nice food including spice cake – forgot to take a pic of that before we ate it! 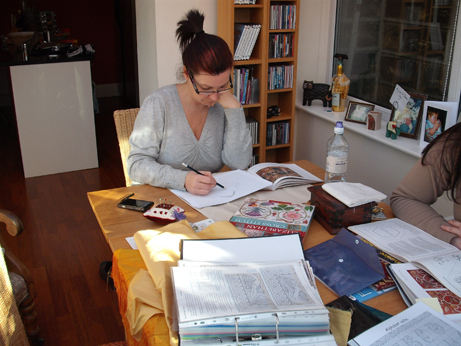 Here are Kerry and Lynn deciding on which projects to work on. It's the glasses sweetie - make you look very serious! 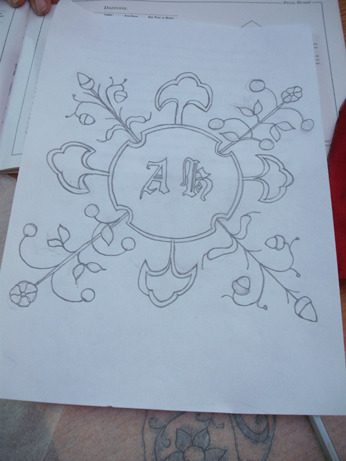 Kerry and Lynn decided to do goldwork and Tracey needlepoint. 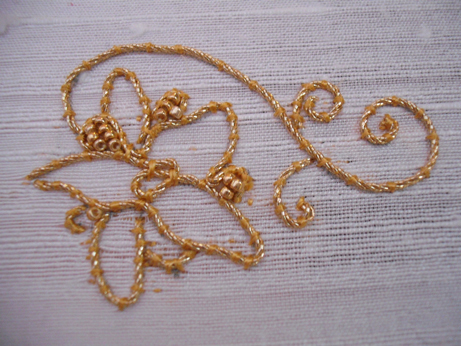 This was Kerry’s first attempt at goldwork and she decided to do a little flower – a borage – in couched thread on a white silk background. 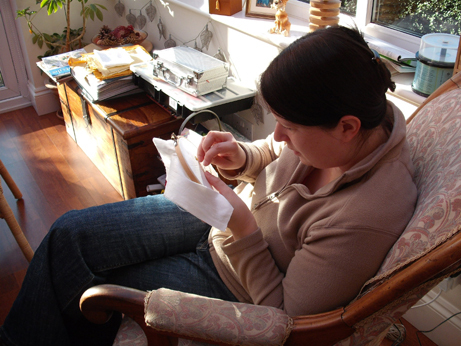 Kerry with her goldwork - look at the lovely sunshine we had! 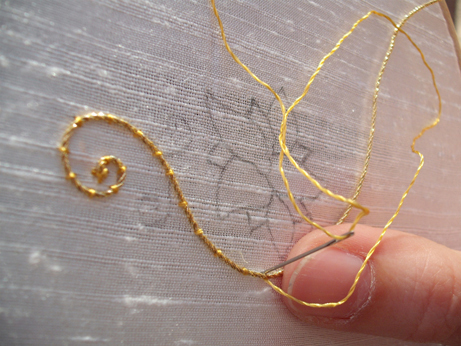 She did a brilliant job and by the end of the day had completed all of the couching and beads – she just has the silk shading on the petals to do. 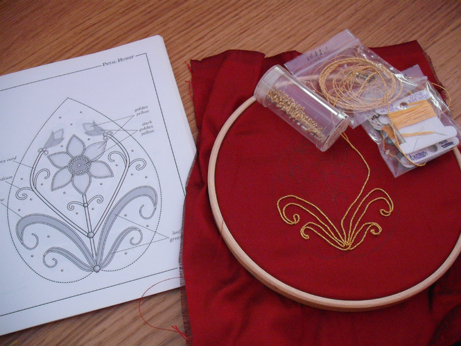 Lynn did two projects – the first was based on a Bess of Hardwick piece – this is the outline of a goldwork project. 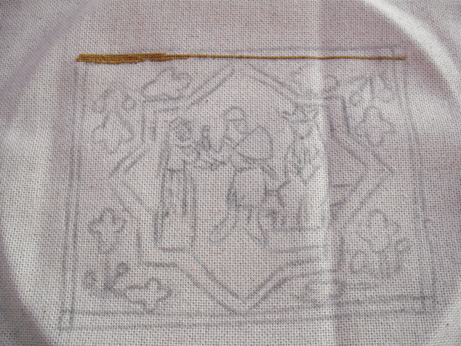 The second was a flower motif taken from one of the books which Lynn is couching onto red silk. A huge project to complete here ! 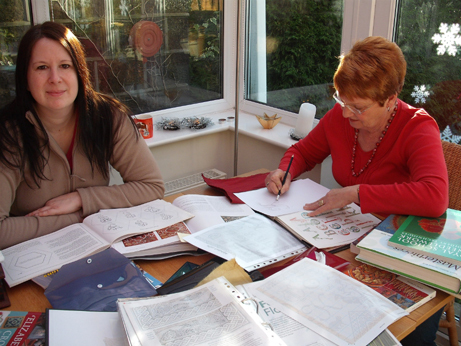 We had a lovely time and hope to arrange another day soon to do some blackwork. 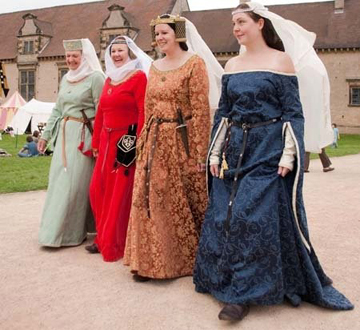 I will leave you with some pics of the girls all dressed up in kit at our events. Do hope you have had a nice weekend – thanks for visiting.